You may have noticed that I don't love inspirational fiction (if you somehow missed this, check out my review of The Christmas Jars by Jason Wright). If an author wants to inspire people, fine, but I prefer that he/she approach it in one of two ways: either write a straightforward, self-help book or weave the message into a story so compelling that I don't know (or don't care) that it's really a sermon. When my oldest son was younger, I often tried to slip educational facts into his daily activities. I must have been obvious, because he would always say, "Stop teaching me, Mom!" I find myself screaming this same sentiment (in my mind, of course) to authors of inspirational fiction - Stop teaching me! Inspire me, please, but don't be so obvious about it. I am a noticer. It is my gift. While others may be able to sing well or run fast, I notice things that other people overlook. And you know, most of them are in plain sight ... I notice things about situations and people that produce perspective. That's what most folks lack - perspective - a broader view. So I give them that broader view ... and it allows them to regroup, take a breath, and begin their lives again (6). Jones' observations help a grieving homeless man; a couple on the brink of divorce; an unscrupulous builder; a widow whose lost hope; and many more. The sage refuses reward, and often disappear before anyone's had the chance to thank him properly. In fact, he's a bit mystical, appearing here and there, always in the perfect place at the perfect time to help someone in need. An angel, perhaps? No one knows - they only know that his encouragement has helped them gain perspective. And that has changed their lives. Now, obviously, Jones' advice is Andrews' way of helping readers gain perspective in their own lives. By "hiding" his message in a story, the author's sermonizing becomes a little bit more palatable, but it still comes off as preachy. In a genre known for one-dimensional characters and too-good-to-be-true outcomes, The Noticer stands out for one reason - Jones. The character comes off as warm, humble and appealing. While the rest of the story is pretty saccharine, it's not as bad as some (Christmas Jars, for instance). Overall, I found it hopeful and yes, inspiring, albeit in a vague sort of way. I didn't love, love, love it like a lot of readers seemed to, but it's definitely the kind of quick, positive read we can all use from time-to-time. Inspirational fiction's still not my genre, but I survived the read thanks to a magical character called Jones. Along with the book, Andy Andrews has launched a grassroots campaign to encourage people to "notice" the individuals who have been influential in their lives. The book promotes the idea that since our time on Earth is so short, it should be used wisely and unselfishly. The Noticer Project seeks to identify and thank those who take this adage to heart. It's a powerful idea, especially in turbulent times when we tend to focus on our own problems rather than being grateful for those who constantly help, support and care for us. If you want to get involved, check out the website. 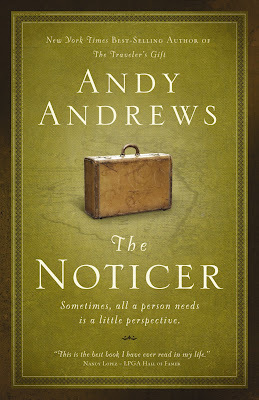 If The Noticer sounds like a book you might be interested in, then lucky you - I have 2 copies to give away. Leave a comment on this post "noticing" one person who has made an impact in your life. I will pick a winner on Sunday, May 3 (I have lots more books to give away, so this contest has a short timeline). This giveaway is open to readers anywhere in the world! Okay, that was long. Mother day soon! I love givaways. One person who made an impact on my life was my 10th grade english teacher. One person that made an impact on life is my mom. She was lost to a disease for years and became very sick, leaving the doctors to claim, she has 4 months to live. It is one and a half years later and my mom is stronger than ever with a ton of humor and love. She has shown me....how to be brave, humble and strong. One person who I've noticed as having made an impact in my life is my daughter's soccer coach. By teaching her well... and encouraging her to do better... have enriched her life greatly! Another giveaway! And you're right, I could use some inspiration these days. There are many people in my life that have made an impact, whether inentional or unintentional, but the one that always springs to mind is my best friend Ange. She always seems to just know when I need her, and she calls or emails (we live several hundred miles apart). She's always doing small thoughtful things for me, and I can feel her love from far away. Thanks for letting me recognize her publicly . . . whether or not I win, I'm glad to wax poetic about somebody special. My late grandmother was quite a lady. Despite severe arthritis she just kept going. So now I always tell me kids that you might not be able to do some things but you can ALWAYS try! Thanks for the giveaway. My next door neighbor while I was growing up. She opened up the crafter/gardener/reader in me. I owe it all to her for teaching me it all! My literature teacher! She is my very own John Keating and encouraged me to go for my dreams! When I was diagnosed with breast cancer a women from my daughter's school was the first to jump at the chance to do things for my family (take my kids for playdates, make us meals) even though I barely knew her. I am happy to say that she is now one of my good friends. Don't enter me. I reviewed it too. I tend to agree with you on the obvious sermonizing. And, while I found a lot of what Andy said, very familiar (his take on the love languages, etc. ), the way he presented it in this story really touched me. And, you're right, Jones was terrific. I would have to say my best friend Anne. She's the most driven person that I know and taught me to take the zen approach to life! I would have to say that my husband has made the hugest impact on my life! My life has been made whole since he's been a part of my life (first as a friend and then as a husband). I wouldn't be the person I am today without his love and friendship. He's amazing! While I'm her mother and would like to think that I've had a great impact on her life, my daughter, Tiffany has made a great impact on my life. She has grown into a fantastic person of whom I am very proud. As a teacher when I hit a stumbling block or need advice I will call her for her opinion. She inspires me to be a better person.